The Rialto Bridge is the most famous bridge over the Canal Grande in Venice. It is one of the most famous bridges in the world. The stone bridge was opened for traffic after a few years of construction in the year 1591. Previously, there were only a few simple wooden bridges over the Canal Grande. These burned down several times. 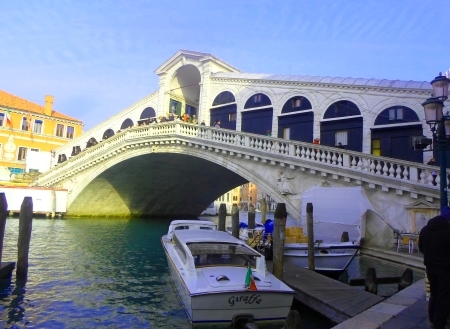 For many centuries, until 1854, the Rialto Bridge was the only bridge across the Canal Grande. In that year a secong bridge, the Accadenia Bridge, was completed. Today there are four bridges over the wide canal. The two others are near the train station Santa Lucia. Since the Rialto Bridge was the only bridge for such a long time, the area around the bridge became the center of the city. The City Hall, the first banks and insurance companies, the main post office of Venice, the main market - all that was and is still in Rialto. The area around the Rialto Bridge is, after St. Mark's Square, the most visited area by tourists in Venice. The biggest sight is the bridge itself. Few bridges in Italy are so famous. At most the Ponte Vecchio in Florence can keep up. The name of the Rialto Bridge (Ponte di Rialto) comes from the words rio (river) and alto (high). Rialto is the highest area on the island of Venice and is not under water during normal floods. It is the most important bridge over the Canal Grande and one of the most famous bridges in the world. Interesting is the construction of the bridge. It consists only of one bow with a huge span. This has the advantage that the passage for larger ships under the bridge is possible without any problems. The headroom at normal water level (no flood) is about 7.50 meters. The Rialto Bridge is 48 meters long. Impressive is the enormous width of the bridge (about 22 meters). More than 10,000 large wooden piles (most of oak) were rammed into the ground to hold the bridge. An incredible performance without machines in the 16th century. Three footpaths lead over the wide bridge. Between them are two store lines. Gold, jewelery, souvenirs and watches are offered in the shops. Some of the stores on the Rialto Bridge are famous upmarket shops and tourist attraction. But the highlight for most tourists is the view from the Rialto Bridge on the Canal Grande Venice. It is also one of the best subjects for photos in Venice, whether with a simple camera or an expensive SLR. The area around the Rialto Bridge was for centuries the most important trading area in Venice. Today there is still a market (Rialto market) near the stone bridge. The Rialto Market is next to the bridge. Almost every visitor of Venice crosses the old, wide single-arch stone bridge several times. It is one of the most popular photo opportunities in the lagoon city. Also the view from the bridge on the wide Canal Grande with its ships and gondolas is world famous. You can see the bridge with public ferries in Venice (water busses). Name in other languages: The Italian bridge name is "Ponte di Rialto". The signpost for pedestrians in Venice is simply "Rialto".